Susan Roebuck: A-Z Challenge Y = You watching it then? A-Z Challenge Y = You watching it then? Not much of a post today. Far too busy, I'm afraid watching the telly. I'm rather disappointed that my invitation got lost in the post and I'm sure the Family is devastated at my absence, but never mind. I did not wake up to watch the festivities but got to see video of it when I did awaken. So lovely. I got up in time to see the kiss. Not much of a kiss, though. Loved her dress and his uniform. Very romantic and beautiful. I'm a sucker for that stuff. I liked the Lancaster fly-past best - my Dad was on Lancasters in WWII. Hope he could see it. I caught the end of the ceremony inside Westminster Abbey and when they rode off to Buckingham Palace, live. heck yeah! who didn't scream when they kissed it up twice... is the sister available... meow! Yes! I did watch, and how lovely it was. Oh I feel like such an idiot but I am such a ignorant fool on purpose. I gave up tv and the news along time ago. Royalty just makes me itch. I missed the whole thing and you know what, I don't care. Sorry just don't get it anymore and I was the biggest fan of Princess Di, I really was. Everything just went downhill after that. Siv - not a problem. I'm not a fanatic by any means and I told everyone here I wasn't going to watch it. But...then I did :) I love brides, that's what it's all about - I always cry, even when I don't know them! And that fly-past, boy oh boy. OK Dezmond - it's a deal. Let's get to the Casino first, though. 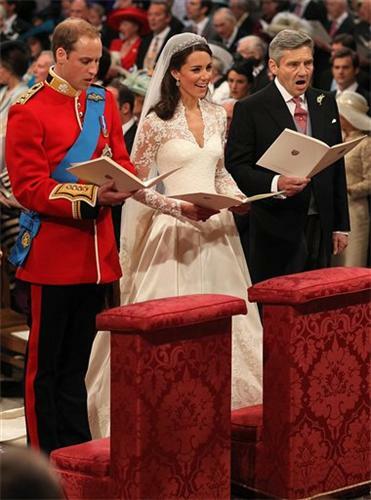 The wedding was great apart from Camilla who, if she HAD to be there should have sat back and not gone in the vestry or on the balcony. I was invited, but they refused to send a car to pick me up so I declined their otherwise kind invitation! LOL Lorraine. Any idea who the two nuns were? Absolutely loved the Royal Wedding and thought it was fantastically prepared and proper. Feel mighty proud to be English!